University of Alberta scientists have taken a critical step towards supplying Alberta's demand for medical isotopes. Their newly published findings could have major implications for other health jurisdictions across North America as well. 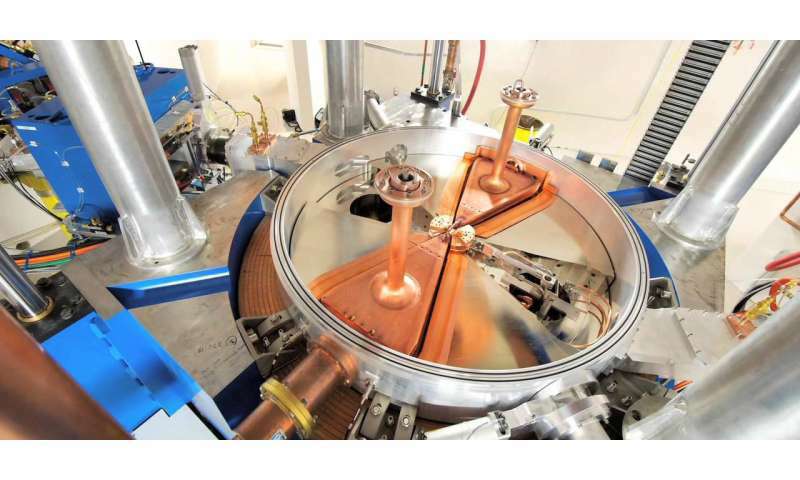 Researchers at the university's Medical Isotope and Cyclotron Facility used a particle accelerator known as a cyclotron to produce enough isotopes for up to 1,000 diagnostic procedures in a day. "We were asked to show that we could make it in the quantities that are required to supply a province and we've done it. We are the only people who have done that," said Sandy McEwan, a professor of oncology at the U of A. The development comes in the wake of the closure last March of the Chalk River nuclear reactor, which was one of two major producers in the world of technetium-99m, the major medical isotope used for diagnostic procedures. Technetium-99m, a radioactive tracer that can be detected in the body by medical equipment, is used in about two million procedures a year in Canada and another 20 million in the United States to help diagnose life-threatening diseases, including cancer. Traditionally, it has been supplied through specialized nuclear reactors that produce molybdenum-99, a radioactive isotope that decays to produce the needed technetium-99m on demand. "Unlike other non-reactor-based methods of producing technetium-99m, the product from the cyclotron is functionally identical to that produced from a reactor. No new equipment or expertise is necessary at the nuclear medicine department," added Jan Andersson, a researcher at the U of A's Medical Isotope and Cyclotron Facility. More than 70 per cent of today's diagnostic radiopharmaceuticals are based on technetium, but the supply chain has proven fragile in recent years. In 2009 and 2010, reactors in Canada and the Netherlands unexpectedly went out of service at the same time and required long-term maintenance, causing worldwide shortages and major disruptions in patient care. The U of A method represents a potential way forward in efforts to ensure a safe supply of isotopes that isn't susceptible to unplanned disruptions. It also bypasses public concerns about the use of nuclear reactors. "One advantage with cyclotron-produced technetium is that the cyclotron is an electrical machine. We don't produce radioactive waste and it's very safe. When the electricity stops, the cyclotron stops and there is no hazard to the public," explained John Wilson, manager of the facility. "There are none of the issues you have with a reactor in terms of public perception, long-term waste and the huge initial cost of construction." The innovation is part of an important strategic Canadian initiative to help counter the closing of Canada's Chalk River Nuclear Reactor. At its height, Chalk River supplied approximately 40 per cent of the world supply of molybdenum-99. According to the U of A researchers, using a cyclotron to produce technetium and other radiopharmaceuticals also offers new opportunities as technological advances lessen the need for technetium in the future. "It's my belief that over the next 10 years, technetium imaging will begin to disappear," said McEwan. "The technology is 50 years old." McEwan explained that what can be measured and imaged with technetium has now been outstripped by what can be done with positron emission tomography (PET) imaging. The cyclotron can produce both technetium and the newer PET imaging isotopes, making it an important transition technology because it means people can run both systems simultaneously while moving their entire fleet of imaging units and scanners to PET. "When the technetium market dies, technology that is specific for technetium production dies because it can't be used for anything else," added Wilson, "whereas a cyclotron can produce a variety of different isotopes for diagnostic imaging that are used in medicine." With new radioactive isotopes increasingly in demand for PET imaging around the world, the researchers believe cyclotron technology gives a capability that ultimately provides the best health care for patients. Though the technology is now proven, its future use for producing technetium is still unclear. Canada's federal and provincial governments will need to determine whether they want to use cyclotrons to replace reactors for medical isotopes, continue to rely on outside reactors or use the technology as a backup when there is need. "Our work now allows a conversation to start on the future of precision medicine with imaging," said McEwan.